The Steel Detailer Projects is the back end portal for filing of inserted models. The Steel Detailer Project Log-in points the filing system to the Project Directory. Project Specific Templates are utilised when opening drawings from The Steel Detailer. This reduces the amount of drawing title block data entry. The Project login also creates consistency across multiple drawings by removing repetitive typing. The Steel Detailer Project keeps a list of all of your Projects in one central location in order to find Project Details for filing and drawing sheet data. The Steel Detailer Project Log-in points the filing system to the Project Directory Vault. The Steel Detailer Project WBS gives the user the functionality to break up a project in to Areas for quick large model management and Zone handling. Searching for models is easier when allocating them a Work Breakdown Structure. Most mining projects require a WBS system because they are large in size. Multiple users also can be broken into Areas whilst working in order to achieve minimal model juggling. Three filters are used to search on Area, Member and Part Libraries. 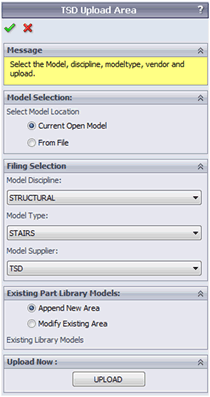 Set the first filter for searching for models in the model library such as Civil, Structural, Mechanical etc. Set the second filter for searching for models in the model library. The model types also set the naming convention for the automatic filing process. The model type code system uses a 26×26 code matrix of two letters. Set the third filter for searching for models in the model library is the supplier. A supplier can be a supplier of a vendor item, or simply your company name if you have designed the model. The Steel Detailer Connection Codes are used to file Connections independently of their type. The code System uses a 26x26 code matrix of 2 Letters. If I was to search through a project that has been created using the The Steel Detailer and used the Filter in the Feature Manager I would see all End Plate Connections only. 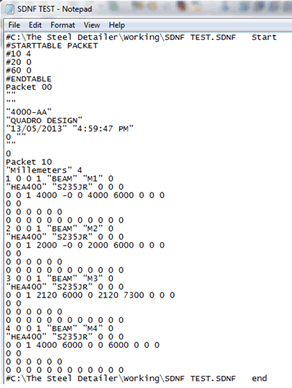 All TSD Connections are filed under this code system and uniquely identifies them. The database tools are used to copy projects and libraries from 1 PC to another including files and database data. For example, if you work off site for a small period and need to sync your libraries and projects with the office then this tool will allow you to do so. This means that both pc’s will have the same libraries and the a selection to sync projects. Upload to the Area Library a complete area for reuse on other projects. An entire area complete with drawings such as a building can be stored in the area library for re-use in other projects. This can save an enormous amount of time. Insert into a project area, a library area model. 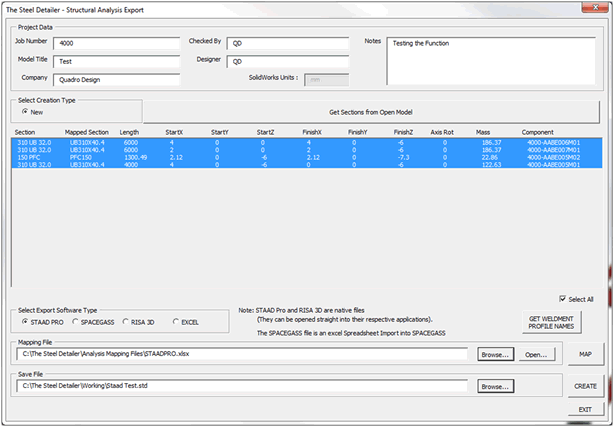 Import a structural data model exported from STAAD Pro, Space Gass, Risa 3D or Excel as a single part Weldment to overlay on top of your existing model for section size checks. Having a model come from a structural package straight into SolidWorks can save time and money. Export solidworks structural models straight from solidworks into sdnf file format for importing straight into other packages such as Tekla Structures X-Steel and Bentley Pro-Steel. 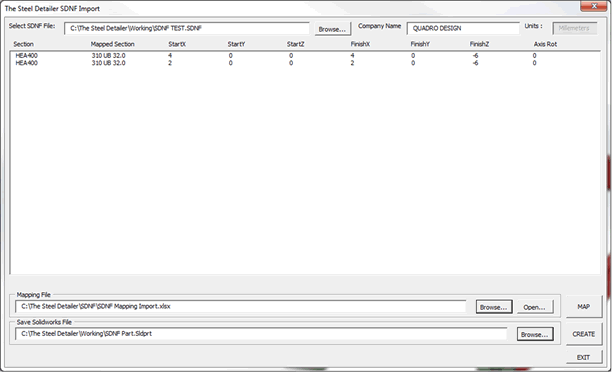 Import SDNF Files into Solidworks as a Single Weldment Part. The export function will create NC1 files for Steel Sections and Plates. A list of the functions will also be available. A list of sketch segments is obtained so that library member models can be assigned to each sketch segment. When a library member model is added to a sketch segment it stretches along the selected sketch. Library member models such as trusses which contain equations can automatically update diagonal sections. Library models can be preselected with 2 sketches also such as stairs. Configurations and duplication can also be set. When the Create button is selected each preselect model assigned to sketch is inserted, related to the sketch and mated in position 1 after the other. For more information watch the following video demonstrations. The Steel Detailer has an automatic updating system that makes it easier for users to obtain enhancements faster. A quick link to online tutorials for learning The Steel Detailer from inside the software. A quick link to display the startup wizard. Find out which release you are currently using.